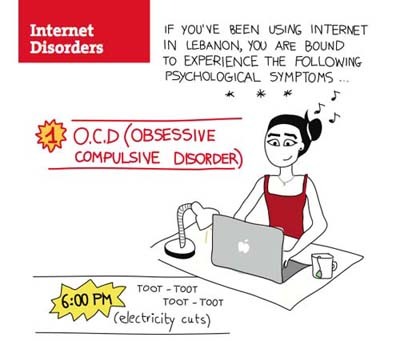 She's young, irreverent, creative, restless, smart, on a brief hiatus as a blogger, but continues to turn out bitingly hilarious cartoons reflecting her frustrations with Lebanese life. That's Maya Zankoul (Twitter handle @MayaZankoul), and her pet peeves are women's rights (or the lack thereof), dysfunctional infrastructure, Lebanon's chronic electricity problems, and its gridlocked traffic. She's also produced two books of cartoons, "Maya's Amalgam" volumes 1 and 2. "It was mostly inspired while I was stuck in traffic," she said. "There will be a volume 3, probably next summer." 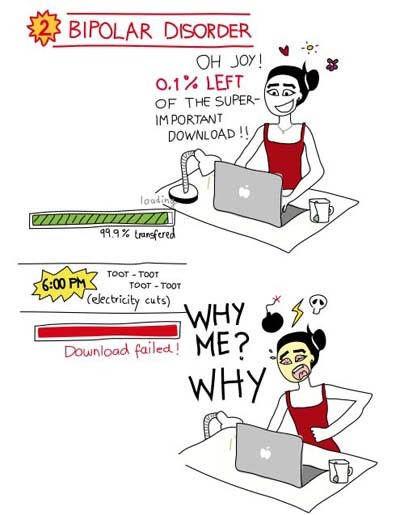 So she vents off on various psychological disorders triggered by recurrent power cuts that invariably bring the country's Internet service to a crawl. 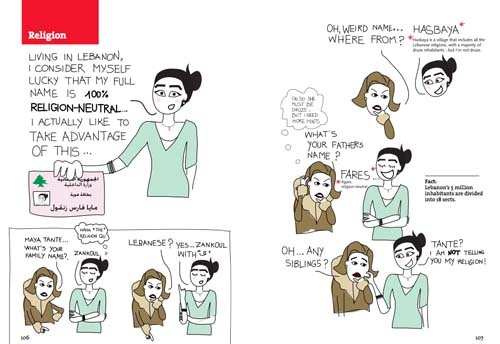 Zankoul is turned off by Lebanon's sectarianism -- there are 18 officially recognized religious sects. People constantly want to know where to pigeonhole her, so she needles them with a cartoon. She skewered her compatriots even more when Mexican multi-billionaire Carlos Slim visited his parents' native Lebanon and raised hopes he'd pour money into the country. The Lebanese went all out to wine, dine and entice him, but they've yet to cash in big. So on her personal blog Zankoul drew a $5 billion "Burj Carlos" to compete with Dubai's famed Burj Khalifa, the world's tallest skyscraper. She also suggested that for a $10 billion handout Beirut be renamed Carlosville, and for $25 billion Lebanon be renamed Carlostan. It's been tough for the 25-year-old Lebanese who grew up in Saudi Arabia and came to college to major in graphic design in a Lebanon she'd only known during vacations. 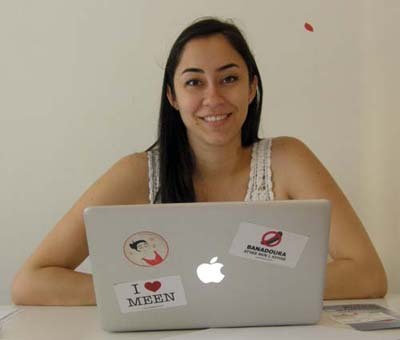 Zankoul first worked as a designer for a Saudi-based offshore company in Beirut. "I was very bored, it was very corporate -- logos, brochures for companies, etc. -- so I decided to create my own space," she said with a twinkle. 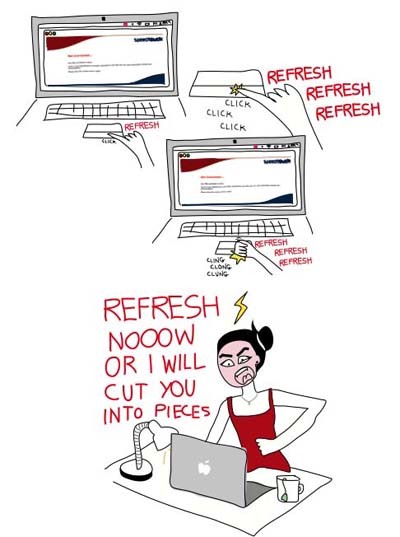 Her disappointment spawned a space online for her rants and illustrations. "At first I just shared them with cousins and colleagues at work," she said. Then came endless comments and suggestions that her illustrations be compiled into book form. For her 23rd birthday some of her fans announced the availability of the first volume on Facebook, much to her surprise. So she began contacting publishers and printers before launching with a mere 500 self-published copies, not realizing that distributors took a hefty 50 percent of the cost. The book, which came out in the summer of 2009, nevertheless made it to the top 4 of the Virgin Bookstore list in Lebanon, sold like hotcakes, and led to a reprint. Volume 2 was published in 2010 and is quite a success. 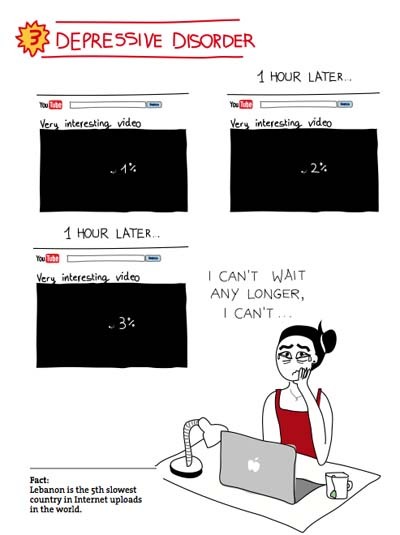 But that's not all there is to multi-tasker Zankoul. She's a graphic designer, who also draws private commissions, designs websites, iPhone and iPad apps, infographics, corporate identities, and shares the space she desperately sought with a couple of young animators and video producers in an apartment on the outskirts of Beirut. Clients like NGOs, local and international magazines, local companies, and web firms are coming on their own, she said, but at least she has the luxury of working when she wants, rather than being confined to a rigid corporate schedule. But it's also been hectic. "I've stopped blogging until further notice," she announced. "I'm preparing for an exhibition and the launch of the Italian version of my books at the Pisa Book Festival on October 21." 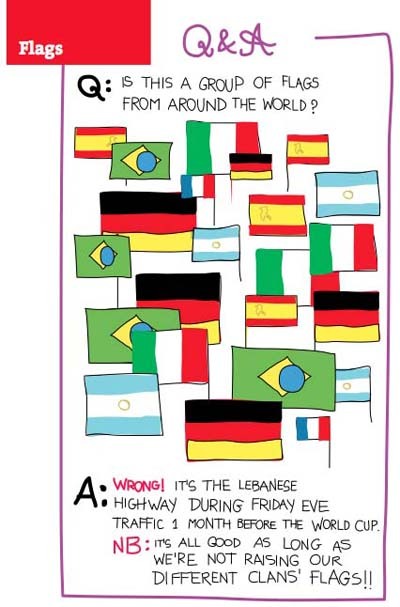 The cartoon barbs, however, are relentless, such as when Lebanese soccer fans plaster everything in sight, including highways dangerously distracting drivers, with the flags of their favorite international teams before and during the World Cup. Zankoul wants to restart her website Maya's Amalgam with a fresh design, and plans to delve into animation. "I wasn't able to keep up with the regularity of posting," explained Zankoul who seems to draw everywhere. "It's a short break. I needed to focus on the exhibition and the launching of the two volumes." So why name a blog and books "amalgam," or mixture? "It was the name of my portfolio during my last year in college," she said, adding that the blog has been therapeutic. "I'm not as frustrated." A link from the blog takes you to the "Zankoulizer" where you can create your own Maya Zankoul avatar. Although an avid social media proponent, Zankoul feels Twitter and Facebook have become too commercial. Asked where she saw herself in five years' time, Zankoul replied: "I never plan, so why confine myself? One thing is certain, she plans to do animated versions of her cartoons for TV.